Bumper fascia is made of resin. Use care when handling to prevent damage. Avoid contact with oily substances. Remove front grille. Refer to EXT-23, "Removal and Installation". 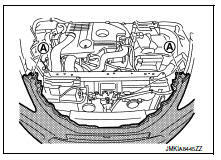 Remove front bumper fascia clips (A) from front bumper fascia upper side. 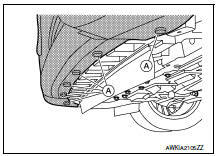 Remove front bumper fascia clips (A) from front bumper fascia lower side. 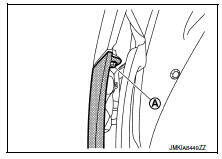 Remove fender protector bolts (A) (LH/RH). 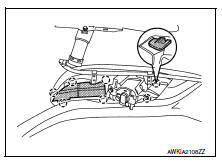 Remove front bumper fascia screws (A) (LH/RH). Apply protective tape (A) to protect the component from damage on each side as shown. 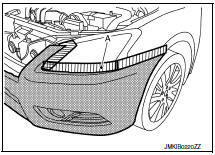 Release the front bumper fascia to release from the front bumper fascia side bracket on each side (LH/RH) as shown. 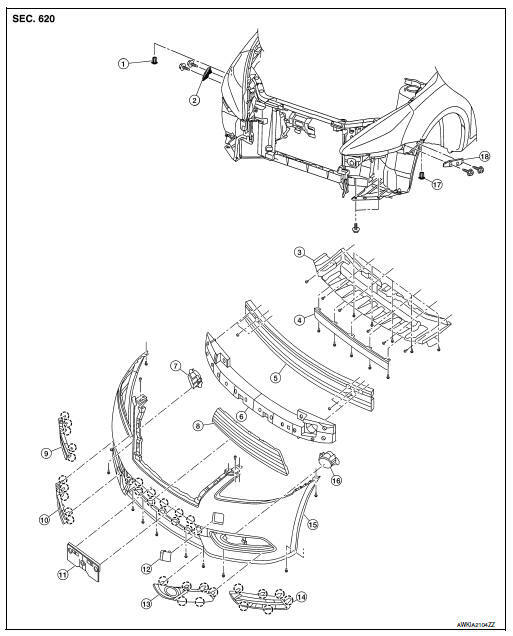 When removing front bumper fascia two people are required to avoid damaging. 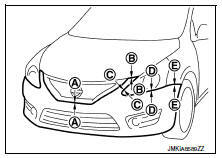 Disconnect the harness connectors from the front fog lamps (if equipped). Remove the front bumper fascia. 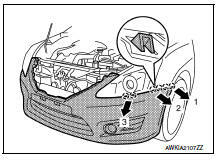 Release front fog lamp finisher pawls, then remove front fog lamp finishers (LH/RH). 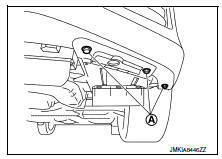 Remove the front fog lamp assemblies (LH/RH) (if equipped) from front bumper fascia. Refer to EXL-122, "Removal and Installation". Remove front bumper energy absorber. Remove front bumper reinforcement nuts and the front bumper reinforcement. Remove front bumper side bracket screws and the front bumper side brackets (LH/RH). Remove front under cover bolts, clips and front under cover. The following table shows the specified values for checking normal installation status.